Shall I compare thee to a Summer's day? With these immortal lines Shakespeare begins his most famous sonnet and perhaps the most famous love poem of all time. But this poem, and more than 100 others, first published 400 years ago in a slim volume entitled Shakespeare's Sonnets, was written by Shakespeare not about a beautiful young woman, but about a beautiful young man, whom Shakespeare addresses… as "e;my lovely boy. "e; If Shakespeare was infatuated with a lovely boy, who was he? 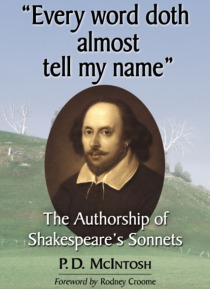 If he was a rich aristocrat, as the sonnets seem to suggest, how did Shakespeare make his acquaintance? Who was the Dark Lady described in the later sonnets? And what is the meaning of the Sonnets' enigmatic dedication that refers to the mysterious Mr.W.H.? These questions and innumerable others have perplexed scholars for centuries. No comprehensive answers to the immensely puzzling questions raised by the poems have ever been presented. This book takes a fresh approach to the difficult issues presented by the Sonnets and upsets many cherished assumptions about the handsome young man, the Dark Lady, Mr.W.H. and Shakespeare himself.